To continue ‘orange week’ we have this wonderful miniature masdevallia species with outrageous orange tubular flowers. 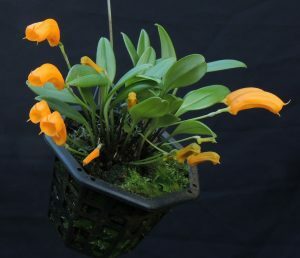 Masdevallia mendozae is endemic to Ecuador where it grows in cool wet forests and we find it does best in a small basket with daily watering throughout the year. The tubular flowers pollinated by humming birds and are produced in profusion over a four month period in the spring. The species has 4cm leaves which for us grow rapidly during the cooler months of the year while it sulks a little during the summer when life in our greenhouse it a little warm for it. The plant shown is potted in bark and all the moss has arrived naturally as a result of the wet conditions we provide. We have found that slugs are fond of the flowers both to eat and to hide in, and so it is worth keeping a close eye on the plant when in flower.